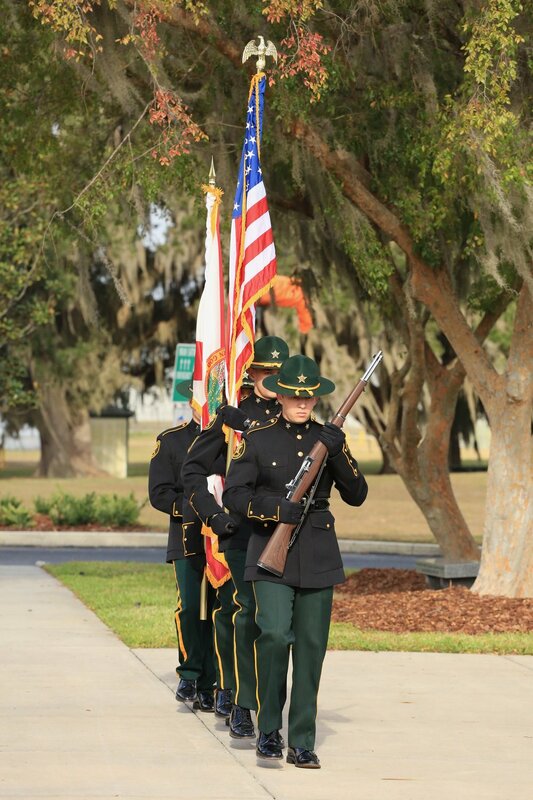 The Sheriff’s Honor Guard was formed as a small volunteer unit in the early 1970’s and has transformed into the now impressive formation that is observed at distinguished functions and ceremonies today. The Honor Guard’s mission is to provide a sharp, professional, military style representation of the Sheriff at memorial services and funerals for fallen officers, parades, and any other event where they are called to appear. One of these is the four Memorial Day services held at the Ocala Marion County Veterans Park. The Honor Guard participates in National Police Memorial Week held in Washington, DC. While at the memorial, the team takes part in the Honor Guard competition which has representation from city, county, state and federal agencies from across the nation. This year, the Honor Guard placed 4th during the exhibition phase of the competition. In 2010, the Honor Guard participated in 22 events around the state including seven funerals, five veterans events, two parades, five colors presentations, and two 9/11 ceremonies.